At the Midland 2009 Model Train Show in Ontario, Canada, fellow Nottawasaga Model Railroad Club members Max Watts (now deceased) and Paul Bailey brought equipment to run on our modular layout. 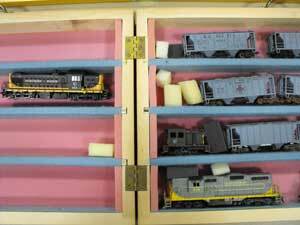 Model train transport to shows and other friends' layouts can pose a problem. Here are several inexpensive solutions. 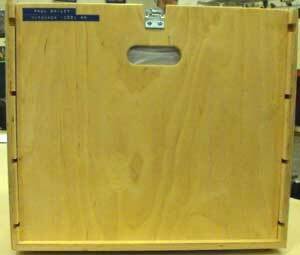 Max had a hinged carrying case made out of thin plywood, the kind used as "door skin". This can also be constructed with any thin plywood. The dimensions aren't critical as long as you leave enough room for the height of your locomotives and rolling stock. Max could transport rolling stock on both sides as shown in the pictures. 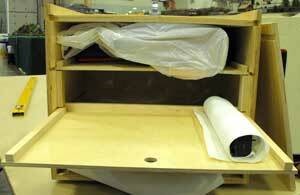 He used a sheet of thin plywood as a separator before closing the unit. I have omitted it in the photos. 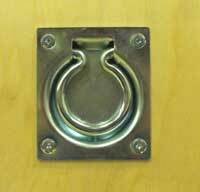 A simple latch and hook on each side closes the unit securely. Double handles made it simple to carry. Paul Bailey approached the problem differently. His concept is based on a carrying case that his grandfather used to transport fresh pies. Again, dimensions aren't critical. Paul's box is about 2-feet square. 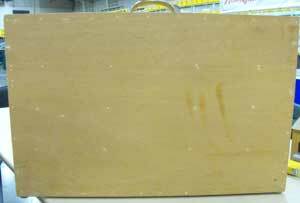 He used slightly thicker plywood than Max did. Paul's shelves slide on narrow pieces of plywood glued and stapled to the sides. Nothing fancy. Very inexpensive. 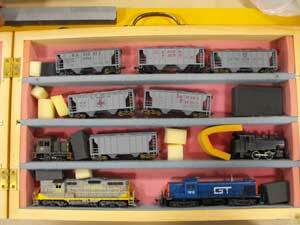 A closeup of the interior shows how simply the model train transport box is built. A latch locks the front in place. Note the wood pieces on the sides. These could also be notched with a router instead. 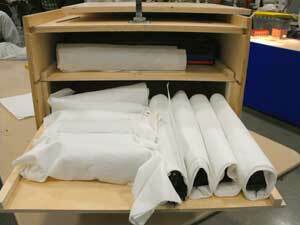 Instead of foam dividers, Paul simply wraps his engines and rolling stock in paper towels to protect them. Inset handles are on each side. Paul finds it awkward to use the handles to carry the box. He decided to put casters on the unit and pull it with a rope handle as we do with the larger model train transport unit Martin Alborough built for our train club. 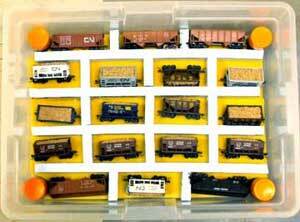 Our Nottawasaga Model Railway Club uses plastic storage totes for model train transport. The bins hold two levels separated by short lengths of PVC pipe. 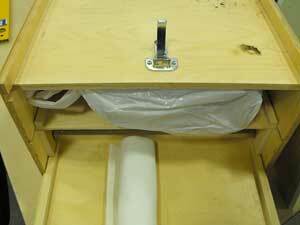 Foam is used for separators and rope handles lift out the center divider of foam insulation board. Works great and it's cheap. Return from "model-train-transport" to the modular layouts overview.